Born at Manchester, Michigan, on June 26, 1842, he was awarded the Medal of Honor for service as Captain, Company D, 19th Michigan Volunteer Infantry at Peach Tree Creek, Georgia, on July 20, 1864 in the Civil War. He was awarded a second Medal of Honor for service as First Lieutenant, 5th United States Infantry, at McClellan's Creek, Texas, on November 8, 1874 in the Indian Wars. 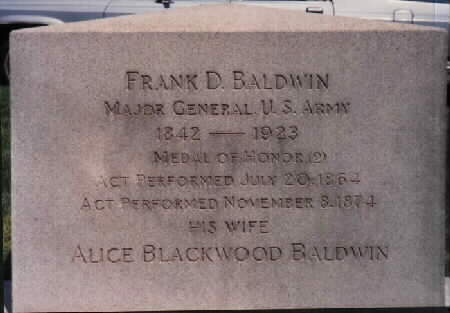 He married Alice Blackwood on January 10, 1867. He served in the Civil War as Second Lieutenant, Michigan Horse Guards, September 19-November 22, 1861; First Lieutenant, 19th Michigan Volunteer Infantry, August 12, 1862; Captain, January 23, 1864; mustered out of the volunteer service, June 10, 1865. In the regular army as Second Lieutenant and First Lieutenant, 19th United States Infantry, February 23, 1866; promoted through the grades to Brigadier General, United States Army, June 9, 1902. He was breveted Captain, February 27, 1890 for "gallantry in action and successful attack on Sitting Bull's camp on the Red River, Montana" December 18, 1876. 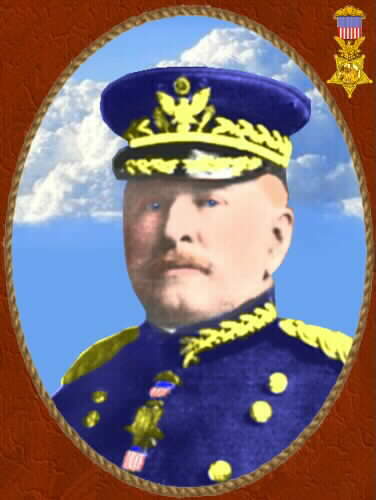 He commanded the first body of civilized troops that ever successfully reached the south shore of Lake Lanao (Island of Mindanao), Philippines, and after a desperate encounter with Moros at the battle of Bylan, May 2, 1902, completely overcame them, with the U.S. losing 51 killed and wounded out of 471, and the Moros losing more than 300, less than 30 escaping. He retired from active duty on June 26, 1906. He died in Denver, Colorado, on April 22, 1923 and was buried with full military honors in Section 3 of Arlington National Cemetery. Rank and organization: Captain, Company D, 19th Michigan Infantry; First Lieutenant, 5th U.S. Infantry. Place and date: At Peach Tree Creek, Georgia, 12 July 1864. Entered service at: Constantine, Michigan. Birth: Michigan. Date of issue: 3 December 1891. Citation: Led his company in a countercharge at Peach Tree Creek, Georgia., 12 July 1864, under a galling fire ahead of his own men, and singly entered the enemy's line, capturing and bringing back 2 commissioned officers, fully armed, besides a guidon of a Georgia regiment. 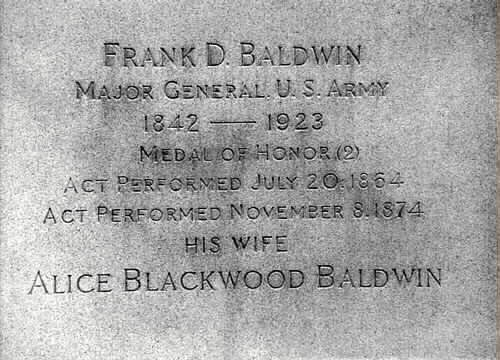 DENVER, Colorado, April 23, 1923 – Major General Frank D. Baldwin, retired, former Adjutant General of the State of Colorado and said to be the only man in the United States to whom the Congressional Medal of Honor was twice awarded, died at his home here last night. He was 81 years old. General Baldwin was born at Manchester, Michigan, June 26, 1842. He entered the Michigan Horse Guards with the rank of Second Lieutenant at the outbreak of the Civil War and served with distinction. He was transferred several times during the war and in 1865, when mustered out of the volunteers, immediately entered the regular army. For “distinguished bravery at the battle of Peach Tree Creek, Georgia, July 20, 1864,” while serving as a Captain in the Nineteenth Michigan Infantry, he received the Congressional Medal of Honor. He retired from active service in 1906 and served from April 1917 to 1919 as Adjutant General of Colorado.